It’s got that smell, of cold fitted cushions in a caravan. The paper is spongy to the touch, and quite thick, unevenly cut along the side and bottom edges. It’s hardback, but not luxuriously so: the type is small, and the book itself is larger than an old Everyman, smaller than a modern Penguin. On the first right hand page, top right, are prices in pencil: ‘1.25’, fairly big and bold, and then ‘6/-’ , fainter and smaller. 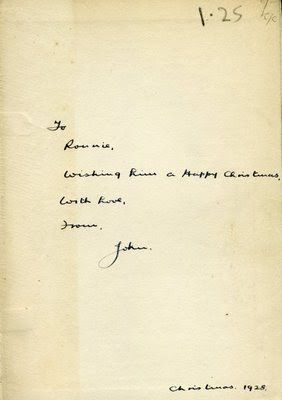 There is a message written in fountain pen, black with a hint of blue, which reads: ‘To Ronnie, Wishing him a Happy Christmas, With love, from, John.’ Who would bother with all that punctuation now? Lower down, in the same hand: ‘Christmas. 1928.’ The book is half preface and half play, the preface being broken down into breathless chunks stamped with headlines like ‘Joan the Original and Presumptuous’, ‘Was Joan Suicidal?’, ‘Joan a Galtonic Visualizer’. The content is didactic and disordered, mostly tending towards the point that contrary to popular opinion, Joan did have a fair and considered trial in 1431, and that the re-examination of the evidence in 1456 which exonerated her and marked the beginning of her legend was a ‘corrupt job’ (p. xi). Joan was canonised in 1920, which explains why this play was written when it was (1924). Shaw doesn’t think that Joan’s execution was justified, his point is that previous accounts of the story have been too polarised, with Joan pure, beautiful, saintly, and her prosecutors old, corrupt, stodgy. They don’t understand the context, and especially the difference between secular and religious authority. All the same, some of his pronouncements apply equally well to both: ‘The more obedient a man is to accredited authority the more jealous he is of allowing any unauthorized person to order him about.’ (p. xlviii). Except – who could possibly have the authority to accredit God? Sitting in a house stuffed with crime novels it was a thrill to read that ‘There are no villains in this piece. Crime, like disease, is not interesting.’ (p. lv). Shaw has a very likeable tone in his preface – the restless, flitting, energetic intellectual (how appropriate for Leslie Howard to have starred in Pygmalion, the manner is the same). I warmed to him even as I wondered what he was doing explaining away his play. He describes it as a ‘sober essay on the facts’ (p. l), but how sober can an essay be which compares the fifteenth century Vatican with twentieth century Trade Unions? The explanations mean that, by and large, the reader knows in advance the effects that the play is aiming towards: it wants to humanise both Joan and her prosecutor Peter Cauchon, rescuing her from the myth of purity, and him from the myth of corruption. But Cauchon’s corruption at the trial is replaced by Warwick’s (he threatens to have her killed whatever the outcome), and Joan’s purity of purpose is never in serious doubt, though there are a few references to her not being all that pretty. The interesting scenes are early on, when Joan’s conviction carries all before it, forcing the French nobility to let her lead their army by sheer force of will. Robert de Baudricourt is the weak-willed blusterer whom she forces into recommending her to the Dauphin. He opens the play with the marvellous line: ‘No eggs! No eggs! Thousand thunders, man, what do you mean by no eggs?’ (p. 1), before flatly refusing Joan admittance for the nth day in a row. Once she does get in, she makes short work of him, and the possibility that she might actually be in some way divine is suggested at the end of the scene when, after she has secured the recommendation and departed, the hens start laying again. Scene two follows the same formula, with Joan exerting her naïve charm at court, this time winning over the weak Dauphin, Charles. Joan makes short work of him, too: ‘ I can turn thee into a king, in Rheims Cathedral; and that is a miracle that will take some doing, it seems.’ (p. 31). In the same scene, the Archbishop neatly side-steps the question of Joan’s divinity, saying that a miracle is ‘an event which creates faith’ (p. 23): it is true for those who believe in it, and its objective truth is unimportant. And Joan, a confidence-woman who can’t judge when to stop, takes on ever grander military objectives until the inevitable defeat, capture, and trial. As the circumstances get more serious, the play’s charm ebbs away, and the trial and epilogue seemed less important than the feel of the paper, the inscription at the front, and Christmas 1928. Damn, I really meant to do some Times New Viking listening in the week leading up to this, somehow didn’t. And double damn, the whole gig has been shifted forward by an hour and a half, so I have to run all the way from the bus station to catch the second half of their set. Perhaps this wasn’t meant to be, but listening to Rip It Off this morning they do sound like one amazing live band. It was worse for Chris, who stood on the steps outside in a snail-paced queue listening to them rattle off ‘their six best songs’ though several solid stone walls, fuming. Once we got inside, the pace of the set slowed a little, songs stretched out beyond the three minute mark, and it was all good stuff, fuzzy, frantic, plus American and no-nonsense (there’s something great about the way certain Americans can rock as casually as if they were walking to the fridge in their dressing gowns for some milk), but it would have been good to see the poppier end of the set too. Another time, hopefully. The singer / drummer had a Sic Alps T-shirt on, which seemed like a good thing. 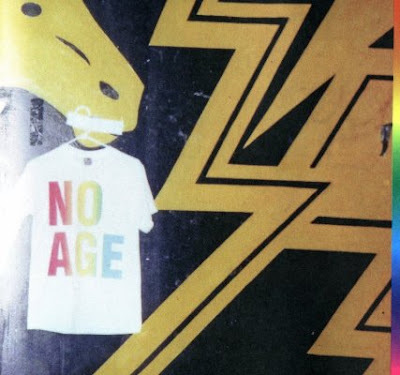 No Age’s set didn’t have a poppier end, but let me tell you what it did have. A (nother) singing drummer who sounded like he came from the same street as Daniel Johnston, a deeply southern accent and even some similar tunes (as one song finished I could have sworn it was a cover of ‘Why / Without You’, but it was over too fast to really tell). A guitarist who looked rather like Chris O’Dowd from The IT Crowd, which is to say, more than slightly out of it, with curly hair. He could not understand a single heckle. Their songs had mellow, effect-laden intros but went pleasingly mental as soon as the drums came in. For the final song the drummer came to the front of the stage to sing, the guitarist swapped his semi-acoustic for an SG, started up with a metronomic delay / loop thing, which he left running as he clambered to the top of a speaker stack. He sorted out his pose, wobbling a bit, whilst the drummer returned to his drums and prepared for even more mental-ness. Which duly exploded, and was so fabulous that the guitarist was inspired to wedge his SG into the lighting rig (à la Kawabata Mokoto at Stereo last year), where he left it as he climbed down to stage level again. Unlike Kawabata, this fellow left the guitar plugged in, and, not really having thought it all through, attempted to remove the lead by giving it a good yank. Bringing the guitar crashing down, and nearly killing several of the front row, had they not moved back pretty swiftly. He came over to apologise, like it had been a total surprise that the guitar had fallen when he pulled at it. There was a stunned silence. Still, no-one was actually hurt, and it did prove I suppose that No Age really are as stupendously dumb as their sound leads you to hope they might be. Which is great for indie rock, but if you go and see them, do stand back a bit. The headliners were Los Campesinos!, which I was cautiously looking forward to, having heard a few singles and quite liked them before they got annoying and had to be deleted. Their dreadful cover of ‘C is the Heavenly Option’ was the point at which I gave up, but I didn’t mind their own songs so much, and imagined that they might be the kind of thing better enjoyed live. But sadly not. ‘They’ve got a publicist,’ muttered Chris darkly, as they lined up on stage, about a hundred of them, the male singer in a red hooded top, the female one with woollen orange leggings on her arms. They made a pathetically ‘big’ noise, with the total opposite of the American bands’ insouciance: they meant it, they were going to sing their little hearts fit to burst to deliver their message that indie pop is where it’s at. But hang on, Los Campesinos!, where do you think you are? You’re preaching to the converted, and you aren’t doing it nearly well enough. I’ve nothing against ultra-reverential / referential Welsh pop, but these guys should really leave it to Helen Love. If you’re going to sing about being excited by pop music, you’d better make sure the songs you sing are the equal of the ones you’re singing about (this is why ‘Does Your Heart Go Boom’ is the most ambitious pop song ever – not quite better than ‘Baby I Love You’, but closer than is reasonable). Doing COMPRESSED TO THE MAX thumping and whacking a xylophone over the top is not the same thing. But what really annoyed me was that they dedicated a song to Kenickie, ‘to mark the tenth anniversary of them splitting up.’ Just... don’t, OK? You are not in the same league, you are not even playing the same game. Having left it rather longer than we should have, we walked. As for Kenickie, remember them this way. A text message from A. yesterday morning: ‘Completely 4got about the Clare Grogan signing 2day at Borders. R u n S working 2day?’ I’m not, as it happens. And he’s right, she has a new kids’ book out, the first in a series of three ‘Adventures of Tallulah Gosh’. It is of course totally tremendous that there are to be stories about that top celebrity, first sung about on ‘Talulah Gosh’ by Talulah Gosh (I never noticed it only had two ‘l’s before) way back in nineteen eighty something, the song that put the pop into indie pop, the fi into lo fi, and – more importantly – announced Amelia Fletcher’s arrival as a great singer. Not that I remember it from the time, but there’s that compilation on K. Brilliant song, in any case. Though what it has to do with Clare Grogan of proper ’80s chart pop stars Altered Images I couldn’t tell you. I couldn’t tell you much about them at all, in fact, but I know that I love ‘I Could Be Happy’, and I know that A. and S. are both daft about Gregory’s Girl, the Bill Forsyth film she’s in. Which leaves the question: are all these fond associations enough to make two grown men with no children go along to a book signing for teenage girls? ‘I’ve decided this is embarrassing after all,’ says A. as we complete our second circuit of the shop. He has brought a record bag with him, with a selection of Grogan-related vinyl, hoping to get it signed. I am clutching a 7” of ‘Happy Birthday’ which he handed to me when I arrived, suggesting I get it signed for S. Which is very kind of him, and a sweet idea, but it does rather preclude the possibility of nonchalantly pretending at the last minute that I’m not here to get anything signed after all, and am merely on my way to the Proust section. In the event, Clare is welcoming and chatty and A. makes all the right remarks about encouraging kids to form bands. With which she agrees – ‘The important thing is not to take it too seriously, to have fun,’ she says, before flipping through a copy of Tallulah and the TeenStars to show him the picture of Tallulah in a Siouxie and the Banshees T-shirt. Then it’s my turn, and I move forward with the ‘Happy Birthday’ single, a chap to the right of the table helpfully handing me a copy of the book to get signed too. Clare detects some reluctance in this, and half-apologises for the coercion. I say no, it was nothing of the sort, I’ll be interested to read the book, being a big fan of the song. Walking away from the table, A. gives me a funny look and says, ‘You do know where the name Talulah Gosh comes from?’ It seems that I don’t. ‘It was the name Clare was going to register with Equity when she became an actor, but Bill Forsyth talked her out of it.’ ‘So the Talulah Gosh song is...’ ‘A tribute to Clare Grogan.’ Thanks, A.! You might have mentioned that five minutes previously! Bloody hell. The book is delightful, and delightfully simple. It’s almost a rags to riches story, except that there aren’t really any rags (all the families involved seem reasonably affluent) or riches either, just the formation of a band, a talent contest for them to enter, and various obstacles in the way of their triumph. The ambition of Teresa (AKA Tallulah, three ‘l’s) and her bandmates is kept low-level: the talent contest prizes are only book tokens, and they’re up against a magician, a spotty French horn player and a dance troupe called ‘Happy Feet’ who take the whole thing far too seriously, developing a bit of an attitude towards Tallulah and the TeenStars. ‘I didn’t care what they thought,’ reckons Teresa, ‘I just wanted us to do our song well and for people to like it.’ (p. 83). People do like it. Fun is had. Parents and teachers do their best to put a stop to much of it, at least to begin with: Teresa’s first faux pas is a band rehearsal in her parents’ garage when she thought they were going to be out, her second is a make-over session in which El, having quit the band as a bassist, rejoins them as a stylist (they have a stylist before their first gig! How Pop is that?) Poppy’s parents don’t appreciate having their daughter done up ‘looking like a tart’ (p. 52), and kick up a fuss. Only occasionally does the story fail to convince – I wondered about the part in which Teresa’s previously hostile sisters win over her parents on her behalf by playing them her demo CD. I would also rather the cool set – Mia and Ava, superior sorts from the year above – had faced some sort of comeuppance, but maybe that’s just me. What convinces the whole way through is Teresa’s narration, full of enthusiasm, scattered with 21st Century allusions (we first see her playing her song ‘Baby I Don’t Bebo’ in her room; she and El skip school and go to Starbucks rather than a café), and with perfectly judged swathes of capital letters (‘WOW! THE GORGEOUS ONE SPEAKS!’ (p. 53); at the Betty and the Bee Stings gig, ‘IT WAS THE BEST NIGHT I’VE EVER HAD’ (p. 73); ‘TALLULAH AND THE TEENSTARS, YEAH! YEAH! YEAH!’ (p. 88)). So, though you can pretty much guess what is going to happen right from the start, Grogan does a good job of taking you along through the highs and lows Teresa experiences as disasters loom and are averted. 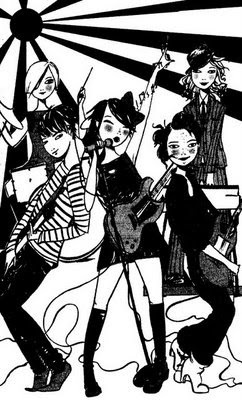 And a great job of making being in a band at school seem not too cool, not too clever, not too geeky, but a fun and a friendly thing to be involved in. A little while after I posted the Planet Sunflower EP last month, Catriona reminded me of another song we’d done, wondering why it hadn’t been included. Of course, I’d forgotten all about it, but rooting through some old CDs yesterday I found one labelled ‘CIGS’. From September 2005, according to the dates on the files. It’s not bad either – a bit of a lopsided rhythm, her voice absolutely smothered in reverb (this is what we do when she sings too quietly), but with a flute on it and everything. I’ve added it to the end of the EP. There are certain kinds of story which make for good TV adaptations: novels with large casts of characters, lots of gossip and abundant conflicts of interest (preferably tied in with the differences in attitudes between generations and / or classes) tend to make more satisfying series than more psychological, inward-looking books. Cranford may not be a better novel than Tess of the D’Urbervilles, but it made better autumnal Sunday evening viewing. It was funnier, for one thing. For another, the romantic leads weren’t centre stage, and if you popped to the kitchen to make toast at judicious moments you could just about ignore them. The Man of Property is the first volume of The Forsyte Saga, a trilogy adapted in 1967 for what is presumably the longest, most character- and gossip- packed costume drama the BBC has ever made (terrifyingly, Galsworthy followed the original trilogy with two more). I’ve been watching it, on and off, for most of this year and, having slightly lost track of who is whose cousin, estranged daughter, long lost husband, etc., have ended up reading this as a quick, handy way of getting a summary of the plot. This is typical of the book’s tone: cynical but rarely one-sided. People with property don’t know what to do with it (other than accumulate it); those with ideas haven’t the resources to carry them through. Only by mixing up Forsytes with non-Forsytes can anything really be achieved. 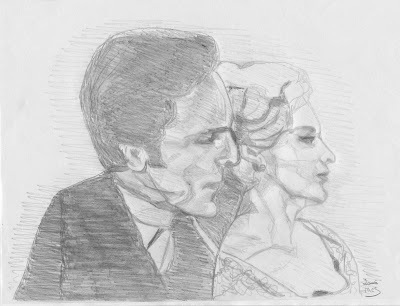 Pure Forsytes are rare: young Jolyon, as an artist who chooses a loving relationship over the propriety of marriage, would seem to disqualify himself several times over, but when an art critic suggests that his watercolours need to be produced in themed batches before they will sell, he manages to work this commercial idea into his artistic vision. ‘All the men who are making great names in Art [...] are making them by avoiding the unexpected’ (p. 196) is the advice, vaguely reminiscent of a recent Damien Hirst radio interview in which he talked about the ‘lines’ of his work – the butterfly collages, the animals in formaldehyde – and how he was thinking of phasing some of them out. Because the idea is done, or because it will increase the value of the existing pieces? Hirst, surely, is a Forsyte. Information is property too, and the fresher it is the more value it has. Isn’t property ridiculous?